How to set up a new Submittable account and launch your first call for submissions. Congratulations on signing up for Submittable! Please follow the instructions here to get started with your new account. Setting up your first submission call and customizing your form will take about 10 minutes. After that, you can immediately start accepting submissions in a variety of formats such as text, audio, video, or images. To begin, select the Forms page from the navigation bar in your account. Add a new form by clicking the Create Form button in the upper right-hand corner of your Forms tab. You’ll be taken to the Form Builder’s General Settings tab. Submit your short story, up to 25 pages in length. Entry fee: $10.00, which includes a copy of our Spring 2018 issue. 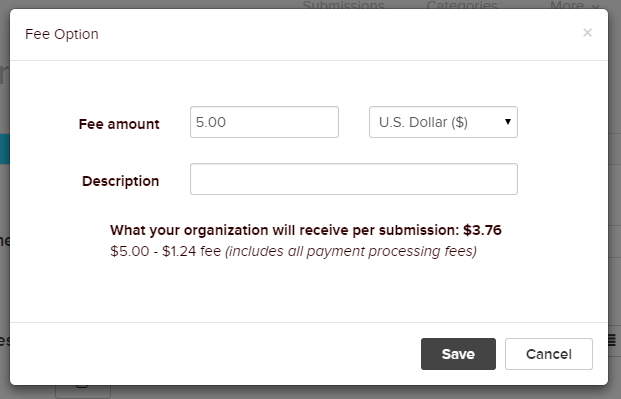 Price: You can optionally charge a fee for submissions. Submittable provides built-in credit card processing, and you must enter an amount of $2.00 or greater. Submittable receives 99 cents + 5% of all fees charged. You will be shown a breakdown of the charges, and the net amount that your organization will receive per submission. Add-on Payments: Add-on payments are an optional feature that may be used to charge fees for anything other than the submission fee. Organizations may want to offer submitters the option to purchase print journals, company merchandise, or memberships using the add-on payments feature. Starts On: Enter a date here to open the form to receiving submissions beginning on a specific date. Expires On: Enter a date here to close the form to submissions on a specific date. Hidden: Checking this box will make this form hidden from your public forms webpage. Submitters will only be able to go to this submission form if you send them the direct link to it. Limit Multiple Submissions: Checking this box will restrict submitters from making more than 1 submission to a particular form from a single account. Live: Checking this box will make your form "live" on your Submittable portal website. It will appear in your public forms webpage, and users will be able to submit to it beginning on your start date. Archive: The archive option is used after you have completed a call for submissions and are no longer using your form. Checking the Archive box will remove your form from the search filters. However, any submissions from the form will remain searchable for future reference. Once you've completed your General Settings, scroll back to the top of the page and click on the Form Designer tab. The Form Designer is where you create the submission form that your submitters will complete. By default, the form includes a Title, Cover Letter, and File Upload field. These are 3 form field types you will likely want to include in your form. However, any field can be removed and replaced with the options available in the Toolbox to the left. To remove a form field, click on the garbage can icon in the upper right corner of the field. To add a new field, click and drag the desired field over from the toolbox. To re-order the fields, drag and drop them within your form. To edit a field, hover and click on it, then make any preferred changes. Please note that if you remove the Title field, submissions will be assigned an auto-incremented number as they are received, starting with 0001, and that number will display as the submission title in your Submissions List. If your organization is running a Blind Review process, you may want to exclude the title field to help preserve submission anonymity. Scroll down and click the Add Files button in the file upload field. 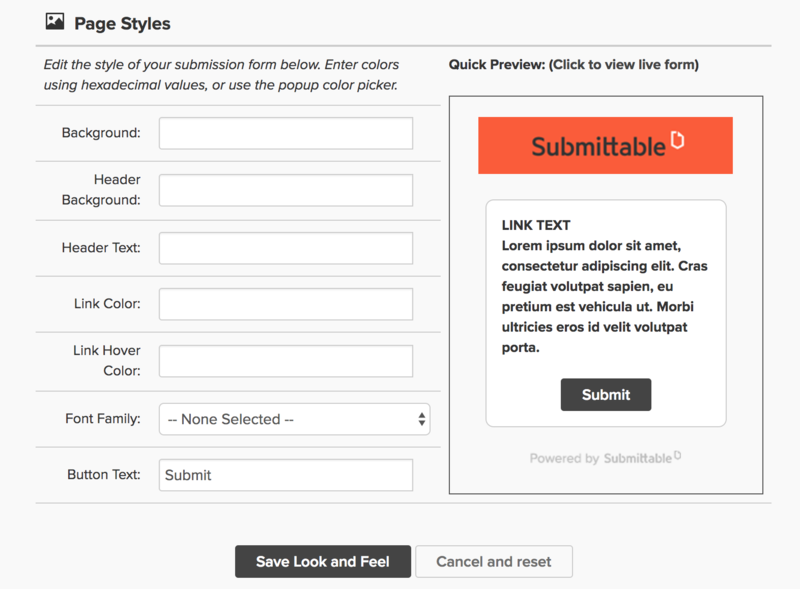 Select the acceptable file types you’d like to allow the submitter to send with their submission. Submittable allows multiple files to be uploaded to each file upload field within a submission. Choose the number of files you would like to allow the submitter to upload per field. To edit a field, simply click on the field and make your preferred changes. To delete a field, hover your mouse over it, and click on the trash can icon in the upper right-hand corner of the field. To make a field blind, check the Blind checkbox for that field. Blind Level: This setting is used for keeping your reviewers from seeing selected information about submitters and submissions. You can optionally set a blind level to hide identifying information about the submitter, as well as fields you've specified to be blind in the form designer. Any team member at or below the level chosen will not see blinded information. Default Note Visibility: Choose the visibility setting for notes that are attached to submissions in the Submission Details page. Team Member(s): Auto-assign team member(s) to new submissions for a particular form by choosing their names from the Team Member(s) list. You can hold the CTRL key while clicking to select or deselect names from the list. Receive an email alert for each submission? : This option determines whether you'd like for you - and your review team - to receive (or not receive) an email alert whenever a new submission is received. Choose an auto-response: Select a Response Template that will be sent to submitters when they submit to this form. This message will serve as a confirmation to submitters that they have successfully completed a submission to your call. If you don't create your own custom response, a generic notification will be sent as conformation. Success URL: You can specify a URL that submitters will be redirected to after they have submitted to this form. If you leave this blank, the submitter will be taken to a default success page containing a link to your organization’s main website. After you complete the Assignments and Notifications settings, scroll to the bottom of the page and click the Save Form button. A dialog box will ask you if you wish to continue editing or return to your form list. Select Return to List. Note: you have the option to place a ‘Submit’ button on your website to link your website to your Submittable landing page. Copy and paste the link code from the text box located at the bottom left of the Forms page. We encourage you to personalize the Look and Feel of your Submittable landing page by uploading a header image containing your organization's name and/or logo and by customizing your submission form's colors, font, and button text. Click on the More menu in the upper right corner of the screen. Select Configurations. Then select Look and Feel on the left hand side of the screen. After you upload your image, you will have the option to crop it. To crop your header, grab any corner of the active perimeter and drag it inward. You can grab any edge of the active perimeter and move your cropped area around to place it where you want. Click Save Look and Feel. Or, if you want to clear and reset your selections, click Cancel and reset. Level 4 and 5 account administrators can invite people to join their organization's Submittable account at any time. Usually, team member serve as reviewers or judges for an organization's decision making process. You can watch this short video that walks you through how to add team members, or simply follow the steps below. Click on More in the upper right corner of the screen and select Team. On your Manage Team page, click the + ADD MEMBER button to open the Invite a Team Member page. Select the type of Permission Level you'd like to give the new team member. The permission levels are described in the legend on the right side of the screen. Enter the new team member's Title (optional) and Email address. Click Send team invitation. New members will receive an email that contains an acknowledgment link that they must click to complete the signup process. To view what your submission form will look like, click the View Your Site button in the upper right-hand corner of the screen. This will take you to your public facing Submission Portal Page, where your submitters will be able to read your guidelines and begin the submission process. Here you will be able to see all of the settings you chose when you set up the Look and Feel of your site, and make sure that everything appears as you intended. Click the Submit button to the right of any of your forms, and it will bring you inside the form. What you see there will be exactly what your submitters will see also. Congratulations! You’re ready to accept submissions. We look forward to making your submissions process work perfectly for you.